For those that haven’t read Part 1, please do so now. In it I describe how I removed gluten from my diet and experienced positive health benefits. Then I reflected on how I became sensitive to gluten and how I am in a better position now to handle small amounts of gluten. Has the fear of gluten been exaggerated? Is it just one of a long list of foods that have been demonized unjustly? In the past year there have been many smart individuals who believe this is the case. The new wave of gluten defenders seem to be falling into 2 camps. Matt Stone is a fan of using wheat to jump start a metabolism wrecked by excessive dieting. If someone has a history of food restriction and has developed unhealthy attitudes about food, then food typically thought of as “junk food” can be both metabolically and psychologically beneficial. The thinking here is that by increasing metabolism, so many other health markers move in a positive direction that total health benefits in spite of the wheat. Here wheat is used as a convenient tool to solve a greater problem. I really don’t have much to comment here. It’s an area of health I know little about, but if one can eat cookies to boost metabolism to restore health then, why not? It isn’t denying the possible health issues with gluten, it is about addressing a larger health issue quickly. The other group of gluten defenders state that Celiac represents just 1% and when you add in those with any gluten intolerances that number is only 10%. I’ve talked to a local naturopath whose research suggests that number is 30%. On a recent Robb Wolf podcast with Dr. David Perlmutter MD, author of Grain Brain, also uses the 30% number. Regardless of the number, this camp feels that gluten issues have been overstated. As a side note, I’ve noticed the people in this camp are almost all coming from a fitness background. They tend to be resilient as do their clients. When I listened to Evil Sugar Radio Episode 9, Antonio Valladares and Alan Aragon were mostly dismissive of gluten issues. Alan shared his research stating that 90-91% of the population does not have any gluten issues, so therefore gluten is fine and that projecting these problems out to everyone is absurd. I have a few problems with the logic here. One is 10% is not a small number. What if it really is 30%? That is a tremendous number. Something is going on and even if I wasn’t gluten intolerant, I’d be taking notice. Why are so many people having so many issues with a food that is so prevalent? And what does “fine” really mean? Do we know? I have trouble believing that a food would be harmful to 10% (or 30%), but beneficial to 90% (or 70%). Maybe Alan is right and the much of the gluten demonization is about praying on the insecurities of the fitness culture? God knows they’ve done it before. For me the numbers are too high to ignore and too many smart people have raised concerns that in my opinion have not been fully addressed. Robb Wolf, Paul Jamient, and others have gone into great detail why they feel gluten is best avoided. 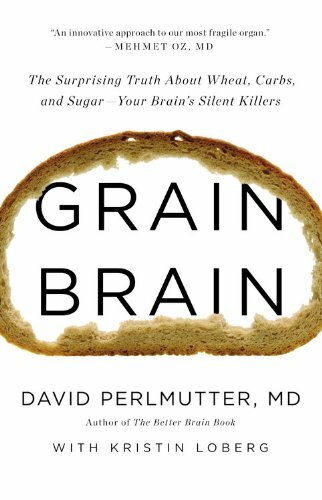 Grain Brain: The Surprising Truth about Wheat, Carbs, and Sugar–Your Brain’s Silent Killers is by Dr. David Perlmutter who sat down with Robb Wolf for a podcast interview on the book. The second half of the interview deals with his neurological concerns related to grains. As I covered in Part 1, I believe I have to some degree healed my body’s ability to handle gluten. It took years, but I’m now more resilient. But just because I’m not showing symptoms when I have soy sauce or 4 oz of beer, does not mean that I’ve accepted that gluten is beneficial. I haven’t. Even if the only benefit I’m receiving from removing gluten these days is that I’ve replaced those calories with more nutrient dense and nutrient diverse foods, then that is still a benefit. And if someday we all learn that gluten was innocent then we can resume eating it at that time. I doubt that will happen, but I’ll keep an open mind. There is a lot of room between making grains the core of one’s diet and eliminating them all together. I find that extreme positions demand more effort than they are worth. So, unless you have a health issue, I say follow a 90/10 or even an 80/20 rule. You will receive more benefit/damage from what you choose as your dominant diet than what floats on the periphery. And so, my diet is dominated by foodstuffs that humans can digest as found (vegetables, fruits, nuts, meats, fish, etc). That alone is my bet and so far so.. great, in fact. @Txomin – Well said. I also suspect traditional methods of grain preparation play a significant role in tolerance over a long period. Not all gluten is created equal. I would guess there’s a huge difference between eating a Twinkee and a slice of organic sourdough bread from a artisan baker. @Glenn – I agree. Thanks for the link you sent me. I think I’m going to one more gluten post. Alan on some forums says gluten sensitivity is just an issue for “hippies” so he think it’s mostly just hippies being silly hippies. But as this article points out – even people WITHOUT the genes for gluten sensitivity and celiacs end up having issues with gluten. And that’s in a controlled double blind placebo controlled study. Good advice if you’re 22 and want to get hyoooge.